When it came to catwalk beauty looks it was all about careful prepping of complexions at Isabel Marant AW17. At Paris fashion week celebrity makeup supremo Lisa Butler used Pai skincare to create glowing skin. Each model was given a signature Pai backstage treatment prior to hair and makeup before hitting the runway. 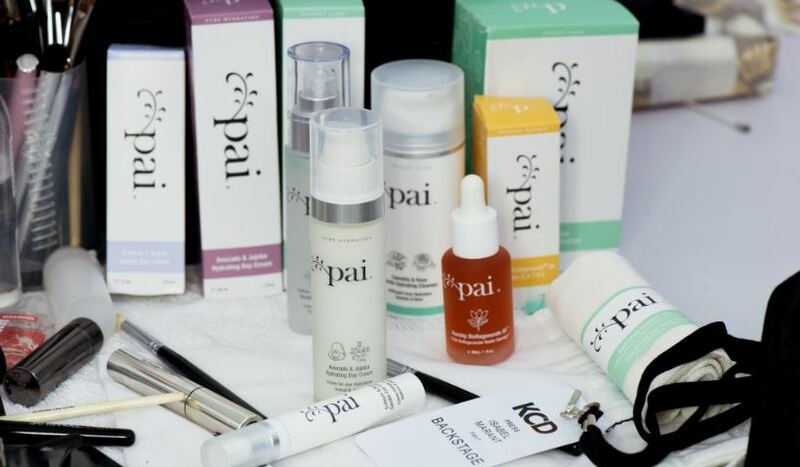 Formulated with the highest quality organic ingredients to calm and protect sensitive skin, Pai is ideal for complexions that may have become irritated by travel or constant makeup removal and re-application. 1. Carefully remove existing makeup and impurities with the Camellia & Rose Gentle Hydrating Cleanser. Massage in an upward motion across the face and neck to lift impurities. Alcohol and detergent-free, this creamy cleanser creates the perfect hydrated base. 2. Spritz the Lotus & Orange Blossom BioAffinity Tonic across the face to refresh skin and calm the senses. The Lotus plant ‘Living Water” in this cooling toner rapidly reduces redness and irritation. 3. Apply the Rosehip BioRegenerate Rapid Radiance Mask across the skin. This buttery mask revitalizes tired faces to create a dewy finish. After 10 minutes, remove with a muslin cloth for gentle exfoliation. 4. To stimulate circulation and reduce puffiness, massage the face with 3-4 drops of the Rosehip BioRegenerate Oil – paying particular attention to the jawline and acupressure points. This bestselling oil infuses the skin with Omegas 3, 6, 7 & 9 to deeply condition and create a “lit from within” glow. 5. Follow with a pump of moisturizer for added hydration. Use the Chamomile & Rosehip Calming Day Cream for redness-prone skin or the Geranium & Thistle Rebalancing Day Cream for combination skin to create the perfect base. 6. To protect sensitive eyes and create a smooth base for makeup, apply the Echium & Argan Gentle Eye Cream around the orbital bone. face to create a subtle glow.